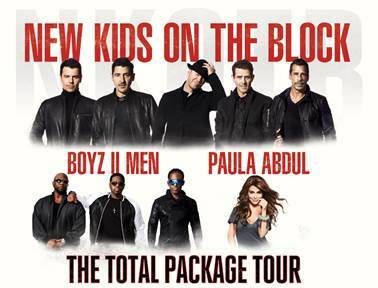 Live Nation welcomes NEW KIDS ON THE BLOCK with special guests Boyz II Men & Paula Abdul to KeyArena on Wednesday, June 7, 2017. Produced by Live Nation, The Total Package Tour kicks off on May 12 in Columbus, OH and will continue through over 40 North American cities, including a special Boston homecoming for NKOTB at the historic Fenway Park. The hometown heroes will return to the field of the world-famous ballpark for the first time in 5 years, when they visited the Green Monster on their acclaimed NKOTBSB Tour alongside the Backstreet Boys. Their return, set for Saturday, July 8th, marks NKOTB’s second time performing at the ballpark, a dream for the five Boston natives and an honor shared with the likes of Paul McCartney, Bruce Springsteen, and Billy Joel. The trek will also include the group’s first performance at the famed Hollywood Bowl in Los Angeles, as well as additional stops in Brooklyn, Chicago, Atlanta, Dallas, and more. Tickets will be available to the general public this Saturday, November 19 at 10am local on www.ticketmaster.com. American Express card members and Block Nation Fan-Club Members can get advance VIP Packages and tickets beginning Wednesday, November 16th at 10am local. Fans can catch the artists discuss what to expect from the tour on media programs across the country, with appearances on Sirius XM, Access Hollywood, Entertainment Tonight, The Insider, E! News, Extra and Associated Press. NKOTB, Paula Abdul, and Boyz II Men will also celebrate the announcement with a fan town hall event at iHeartRadio before they make a special shout-out to NKOTB’s hometown supporters in Boston, MA, appearing on local newscasts to announce their homecoming at the iconic Fenway Park on July 8. With a combined 200 million records sold worldwide, NKOTB, Paula Abdul, and Boyz II Men are primed to have the biggest party of the summer with THE TOTAL PACKAGE TOUR. Known for delivering Blockheads with one-night-only experiences and legendary collaborative events, NKOTB will return to the stage after 2016’s touring hiatus, bringing with them number one hits like “Hangin Tough,” “I’ll Be Loving You (Forever),” and “Step By Step.” The iconic Paula Abdul will perform her legendary catalogue of pop hits, while Boyz II Men will make their second trek alongside NKOTB to perform the rich catalogue of hits that earned the trio the distinction of being the best-selling R&B group of all time.